The word “vast” gets tossed around a lot to describe things like the backseat of an SUV, or a big lawn or the open ocean. These things can all be vast, depending on your frame of reference, but if there is anything that can truly be described as “vast” it is the universe. The size of the universe defies any adequate description or human comprehension. Consider light. Light travels at the cosmic speed limit of 186,000 miles per second. I live in Chicago, and I am often amazed at how big this city is. I could spend my whole life exploring this city and not get to see everything. Google tells me that there are 4300 miles of road in Chicago — longer than the United States is wide — but light could travel every road in the entire city 43 times in one second. One second to travel the entire distance that my first car traveled in its entire lifetime. One second to travel around the Earth’s equator seven times. Our sun is 93 million miles from where I am sitting. At a steady pace of 3 miles per hour, it would take 3500 years to walk to the sun without any breaks for eating or sleeping. The same light that can circle the whole earth seven times in one second takes 8 whole minutes to get from the sun to our planet. Along the way, there are two planets, one about the same size as earth, and one a bit smaller. Venus has a surface area of 177 million square miles — that’s over 750,000 Chicagos. There are six more planets in our solar system, a handful of dwarf planets, an asteroid belt, an Oort cloud, and more. The nearest star to our own is Proxima Centauri. Light from our sun takes 4.3 years to get there. 4.3 years going as fast as it is possible for anything to travel. Our planet is located in a backwater arm of the Milky Way Galaxy. Light takes 100,000 years to travel its diameter. The same light in the same time could circle the earth over 20,000,000,000,000 (20 trillion) times. The nearest galaxy to the Milky Way is the Andromeda Galaxy. It is 220,000 light years across, and 2.5 million light years from Earth. Although it contains somewhere in the order of one trillion stars, the entire galaxy is only visible from Earth as a single point of light. The observable universe is 93,000,000,000 (93 billion) light years across. Light would take 93 billion years to go from one end of the universe that we know to the other. There is more universe out there, but the light from those parts hasn’t reached us yet because the universe isn’t old enough. The universe is only 13 billion years old. The observable universe is estimated to have around 100-200 billion galaxies. We don’t know exactly how many there are, because it would take too long for our instruments to count them all. And again, there is more to the universe than what we can see. We don’t know how much more because, well, we can’t see it. 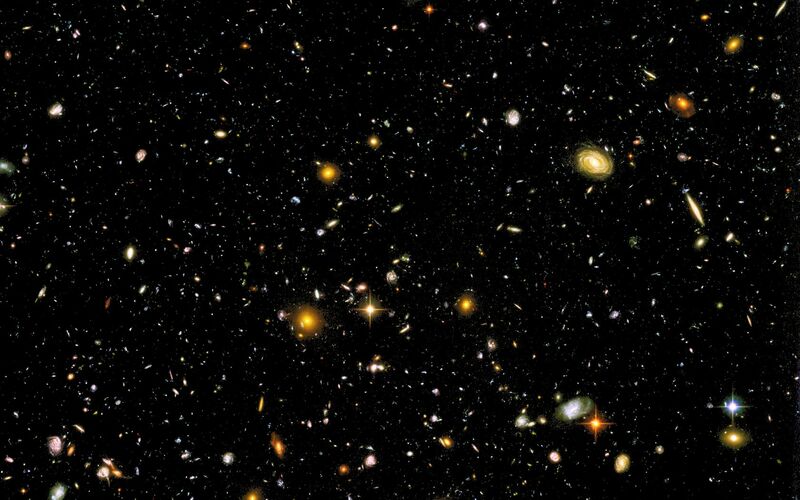 The Hubble “Ultra Deep Field” is a view of part of the universe when it was less than a billion years old. I hope I have given a glimpse of just how big the universe is. It is impossible for me to say exactly how big it is, not just because nobody knows, but because the size is completely incomprehensible. It defies language to describe it, and our brains to understand it. Even if the exact size were known, the number expressing it would be meaningless. A lot of people hear how big the universe is and it makes them feel small. We are the center of our own lives, and what goes on in our lives is important to us. People used to believe that the Earth was the center of the universe because they couldn’t get their heads around the fact that we are unimportant. 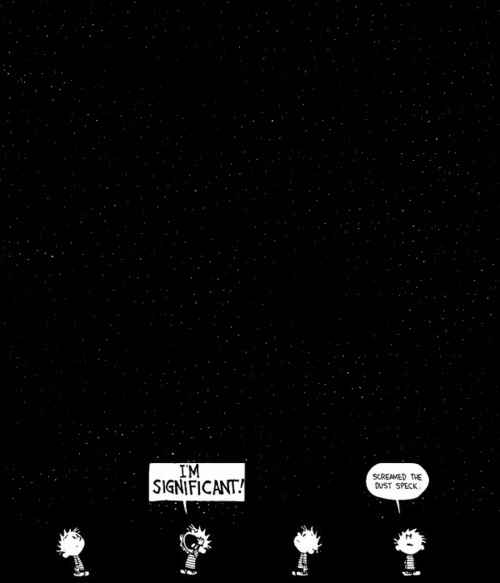 But to the universe, we are less than unimportant. For the sake of comparison, a speck of dust is in the order of 100µm (100 nanometers) wide. I am a little shy of 2 meters tall. 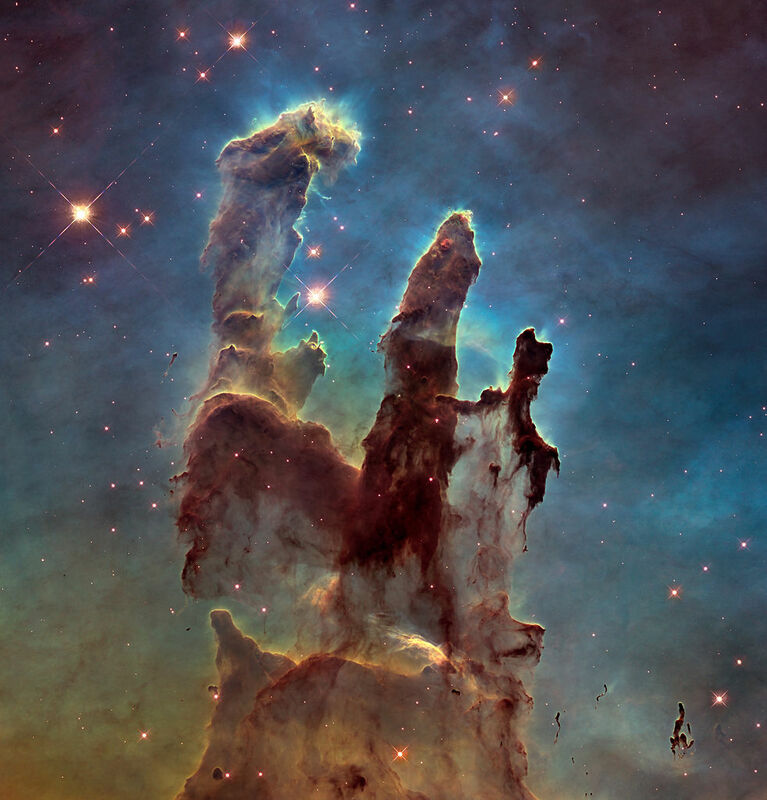 I am therefore approximately 20 million times the size of a speck of dust (length, not volume). The Earth has a diameter of about 12,000 miles. 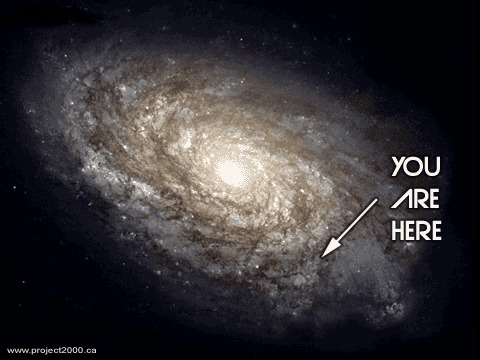 Our galaxy has a diameter of about 600,000,000,000,000,000 (600 quadrillion) miles. Our galaxy alone is 50 trillion times bigger than the Earth. People like to give “a speck of dust” as a measure of insignificance, but to our galaxy alone, the earth is far, far less significant than a speck of dust is to a human. And to the universe, our entire galaxy is insignificant. It is perfectly understandable that the universe makes some people feel small. The size of the universe bothers me, too, but not because it makes me feel small. It has never been a problem for me to reconcile my own insignificance in the scheme of things. I am troubled by the fact that I will spend my life exploring Chicago. I will spend my life getting to know one or two dozen people really well, a have a passing familiarity with maybe one or two hundred more. If I were still a researcher, I would spend my life trying to discover as much about the world as I could. As a non-researcher, I will spend my life learning as much of what others have discovered as I can. But there is so much that I will never know. For all of the things we know about earth, there is so much more that we don’t know. We are just now starting to discover how common other planets are in our galaxy. We know that the universe is believed to be about one quarter dark matter, but we don’t even know what dark matter is. When I look up in the sky and see all that I can see, and understand what I can’t see, it makes me sad that I will never get to know so much of what is out there. So many galaxies. So many stars. So many planets. And I have to spend my life on just this one, with only my short life to see what I can see. There is so much to see on Earth, but the universe holds sights that we cannot possibly fathom. I am troubled because I am a scientist, and I am greedy. Scientists are driven by the knowledge of the things we do not yet know. We see a hole in our knowledge and we want to fill it in. We are humbled by the knowledge of what we do not yet know, and seeing the vastness of the universe can be crushing. The internet is abuzz with the recent publication of an article in Science which replicated 100 studies in psychology, but only found positive results for a third of them. A lot of people are freaking out over this — both scientists and lay people — and I sure wouldn’t want to be one of those scientists whose study couldn’t be successfully replicated. But for those people, it isn’t the end of the world. Most of them didn’t screw up or do anything fraudulent. This is just how science works. A lot of people have talked about what this means about the state of science, or the state of psychology, or the state of whatever else, and I don’t have much to add to this conversation. But this does make me think about a few things about science in general, and it is those things that I want to say a few words about. 1) The publication of a study is not the end of the conversation. I think the media is guilty of misleading people about this. The truth is that you don’t sell many newspapers with headlines like, “scientists discover that X may be true.” What I see instead are headlines like, “scientists prove X is true,” or, “study disproves theory about X.” This isn’t how scientists think about things. If you have never had the pleasure of being in the presence of scientists when they hear the results of a new paper, it is a wonderful thing. More often than not, they will try to find problems with it. Maybe the author conceptualized their problem in the wrong way. Maybe they didn’t think of a confounding variable in their experiment. Maybe their statistics were misapplied. Maybe their mathematical model didn’t describe reality. To the lay person, this might make scientists sound petty for trying to take away a colleague’s accomplishment, but this is just part of the process. Replication is not what you do to show that scientists are terrible, it is just a part of the process. When a new study comes out, scientists often say, “This is really interesting, but I’d like to see more work done on it.” What they are calling for, is more studies to see whether the effect can be reproduced in a different way. This is replication and is the process. A few years ago, one of my own studies was subjected to a replication by another research team. They believed that we had failed to take a particular variable into account, and may have made a type I error as a result. I will admit that I figuratively bit my nails when I heard that this study was coming out. Nobody wants their study to be wrong. But it happened to turn out that even with the new variable included in the analysis, our hypothesis was still supported. It could have gone the other way. 2) When making conclusions in science, there are two types of possible errors: Type I errors and Type II errors. Type I errors are when you conclude that something is true, but it is not. Maybe your study concludes that watering plants with Brawndo (it’s got what plants crave) makes them grow better, when in reality it does not — type I error. A type II error is when you conclude that something is not true, but in reality it is. Maybe you conclude that monkeys are not actually primates, when they really are — type II error. A lot of the conversation around this replication study is about how scientists might be making too many type I errors. This could be true, but it is not my purpose here to comment on that. But I will point out that when you make it harder to make a type I error, you necessarily make it easier to make a type II error. Conversely, when you make it harder to make a type II error, you make it easier to make a type I error. Both types of errors are still errors, and you don’t want to make either one. Here’s how it works: In science, we often use p-values as a tool for figuring out what happened. When you analyze your data, the p-value measures how likely it is that whatever trend you found in the data is the result of random chance and not a relationship between your variables. a p-value of 1.0 means that there is a 100% chance that your data is random numbers, and a p-value of 0.0 means that it is impossible for random chance to create those numbers (in reality, p-values are never exactly 0.0 or 1.0, but somewhere in between). Scientists use a cutoff of 0.05 for drawing conclusions — that is, you cannot tell people that you made a discovery unless there is a 5% chance or less of your data being meaningless noise. If the chance is 6% or higher, you cannot make any claims. Ideally, most things you find with a p-value of 0.05 or less are true, and most things that you find with a p-value higher that 0.05 are not true. But sometimes you have a real effect with a p-value higher than 0.05, which leads you to think it’s false (type II error), and sometimes you have an effect that is not real with a p-value that is lower than 0.05, and you think it’s real (type I error). If you lower the cutoff value to, say, 0.01, you will get fewer false positives (type I errors), but more false negatives (type II errors). If you raise the cutoff value to 0.1, the opposite happens — type II errors become less common, but type I errors become more common. 3) Science is hard, and we don’t know all of the answers. When we take science classes in school, there is always a right answer. You know that the substance is supposed to turn blue when you add the right chemicals, and if it doesn’t, you know you made a mistake. When I was a teacher, I would frequently have students come to me with a test tube full of orange fluid and ask, “is this right?” I would resist a straight answer as much as I could, because the purpose of the experiment was not to teach them how to make the fluid change colors, but to think like a scientist. The domain of scientists is the edge of human knowledge. There is no one to whom a scientist can ask, “is this right?” Because if there was, they wouldn’t be doing science. No one knows the answers to the questions that scientists ask, which is why scientists are trying to figure out the answers to those questions. This means that we will sometimes get it wrong. It is for this reason that I praise the scientists who do replication studies, as well as the scientists who did the original research. It is all part of the process.